Mark Hayle, who provides IT Support at Ferryspeed, is one of 180 men who will put their football skills to the test at the end of this month in order to help local families affected by cancer. FFC aims to relieve the financial burden for families living with cancer by awarding grants which could help with heating costs; travel to/from treatment and parking expenses; or buying new white goods or a sofa. The annual FFC tournament will see eight teams battle it out in matches taking place at local clubs who have offered their pitches to be used including Horndean, Petersfield, Fareham and Porchester. Players pay a £60 entry fee and are encouraged to raise a further £150 through sponsorship. To date, Mark has raised £400 thanks to the generosity of his Ferryspeed colleagues. The charity FFC was founded by one of Mark’s friends, who he plays football with every weekend, after losing a family member to cancer. Since FFC was founded in 2008 it has raised £700,000 and this year, its 10th anniversary, the aim is to reach the £1M milestone. Each of the eight teams in the tournament is formed in memory of a cancer sufferer. Mark will play in a team playing in memory of Lisa Cole, a wife and mother of two sons. Lisa was from Horndean and recently passed away following a battle with cancer. She dedicated her weekends to taking her sons to play football and to football training. “I didn’t know Lisa but I’m honoured to share in her memory and pay my respects by playing in her name,” said Mark. “I’ve always played football; it’s the air that I breathe. 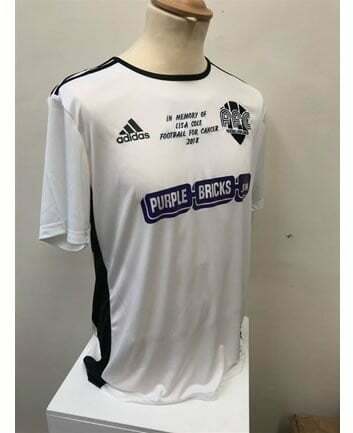 Taking part in the FFC tournament means so much to me not just because of this charity but because around 85% of the population is affected by cancer in some way,” added Mark.